FYI, the last time I made pie crust, it sucked. With perfectly good, organic ingredients I mixed up a horrible, sticky, mess of a deal. I knew it was ruined within a few moments of allowing it to chill in the fridge. It sit there for days, torturing me with the reality of a failed attempt, and, of imposing a pie on the world when obviously one did not care to be brought forth. Another lesson learned, I hope, about feeling my way into action before properly intuitingvia the knowing that place and time were snugged into a compatible position, and the necessary alchemical energy of creation would womanifest. How to deal with this kind of NO? From my pie-baking and art-farmin’ view, 2011 has been quite filled with these moments of surly, herky-jerkey year of starts and stops, snits and fits. Or misunderstood moments of the blessed YES of place and time, or time and place. Even with being the so called gentle Year of the Rabbit, my observations have been such that along with my own adventures there are quite a bit of those snits and fits happening all around. As with the lesson of the wicked pie crust, I realized there was no forcing of the gentle rabbit in regards to my cranking out illustrations. 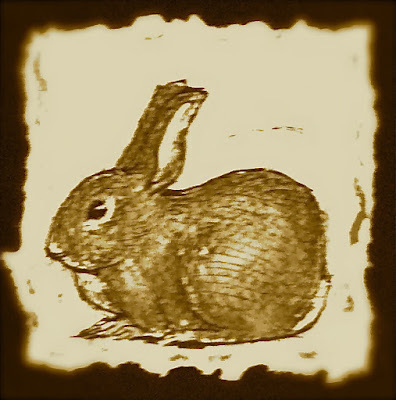 And so, for my 10th, annual Mid-Western version of the Chinese New Year calendar: only a single, little cottontail drawing, sit around my studio for the entire year, like the bad-pie crust did in my fridge (for a few days), to remind me of that lesson again. Sometimes, what refuses to be made or born speaks LOUDLY, and so I told myself and my few and much appreciated “Year of…” collectors that the rabbit had spoken to me, making a request for 2011 to be re-named the “Year of the Invisible Bunny”. What’s in a year? 2012….year of dragon….renamed in my mid-western mind as year of dragon flyers…focusing on story-myth of fierce elemental creatures of our own making ….and the true numbers of the arthopod class of species that outnumbers all others…..
Facebook or Fat Pie? Is that the question? I’ts December the twelfth month of the year two thousand eleven, and I have not written in this “dear self” version of a blog since the sixth month of this year, nor have I baked very many of my special “fat pies”. I have spent most of my time in the “art-farming” realm, as in the garden, and to say the least there have been a few adventures that have kept me occupied in this physical world, in North West Lower Michigan. Presently, I have the urge on this cloud-filled, impending snow-stormy morning to send a letter to myself, through the means of speaking to someone else out and about through this simulated reality. The first thing my brain bounces to is a slight place of dread. Part of me feels like I ought to back paddle through the last six months, and do a update/catch-up…considering this blog business is all about on-going pie-baking and garden reporting or yammering on with my version and twist of this and that. attempt to be an honest person. To tell people straight out that not only do I use Facebook, I also love it. It’s become my morning news feed and info sharing. I’ve always relied on what other people tell me is happening, rather than the daily practice of searching through the media. I tend to trust my friends intelligent observations and open hearts. AND, yes, I posted this photo and poem on Facebook before here with the Fat Pie’s.